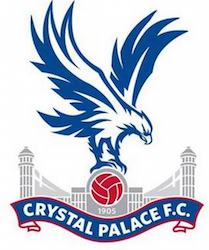 I spent much time to prepare this long and extensive Crystal Palace squad review. Hope you'll enjoy it and give me some hints regarding future tactics. Wayne Hennessey vs Julian Speroni. Whom would you prefer if you were me? I am going to give chances to both goalkeepers. Perhaps some rotation mode should be instantiated for that. Better Arial Ability, Communication, Command Area. There are no more good goalies in the team as far as I saw looking through U21 and U18 reserves. A survival in the Premier League will be a tough task, so I have to decided what defensive line-up to use without variation. I strongly believe it's quite risky to diversify tactical schemes too much. So it should be either 3, 4 or 5 defenders in line no matter how many tactics I will create for Crystal Palace before the first season. There's one star player - Joel Ward. His natural DR position is just a cover of his versatility. Joel can play as DL, MR, MC. The very determined and strong flank defender would be useful for any other PL team. 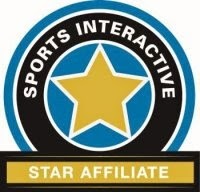 By the way, Stoke and Hull already some interest regarding buying Joel Ward. It should be a challenge to keep Ward in my team. He has a good competitor at the right flank - Martin Kelly - who's a quite known guy in the modern world, graduate from Liverpool academy. As full back Martin Kelly comparing to Joel Ward lacks Stamina, Team Work, Work Rate. But it's good he is also able to play as centre back. Other possible replacement for DR position: highly determined Adrian Mariappa. I can also enumerate good old Peter Ramage placed in U21 and transfer-listed by default at the story start. But he is too limited and slow defender who is worth to play in the Championship instead. As for the left flank, things are not so good here. I would say it's one of the most problematic positions in Crystal Palace. There we have a single decent left back Zeki Fryers possessing high speed and very low passing skills (Passing = 7, Crossing = 6). No more good left backs in the squad. Just quite prospective Jerome Binnom-Williams in U21 team, though he's not ready to play at PL level and should be loaned out. 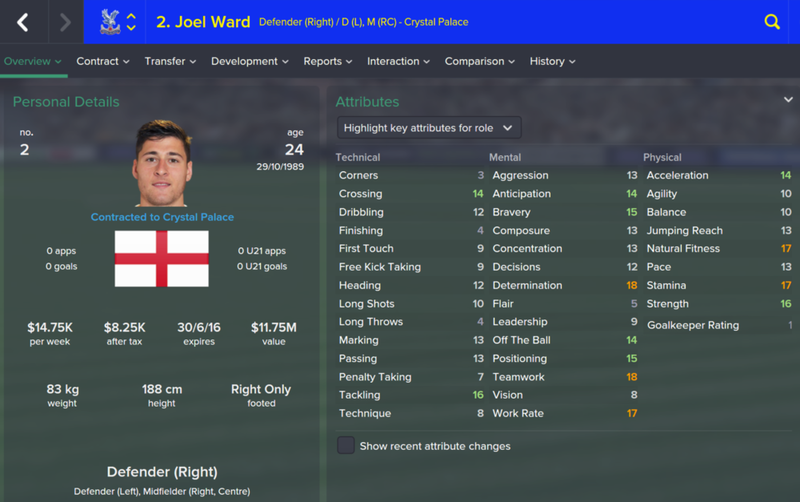 Though I remember I can use Joel Ward at the left flank which is now seems a pretty logical solution. However, Joel's left foot is weak. 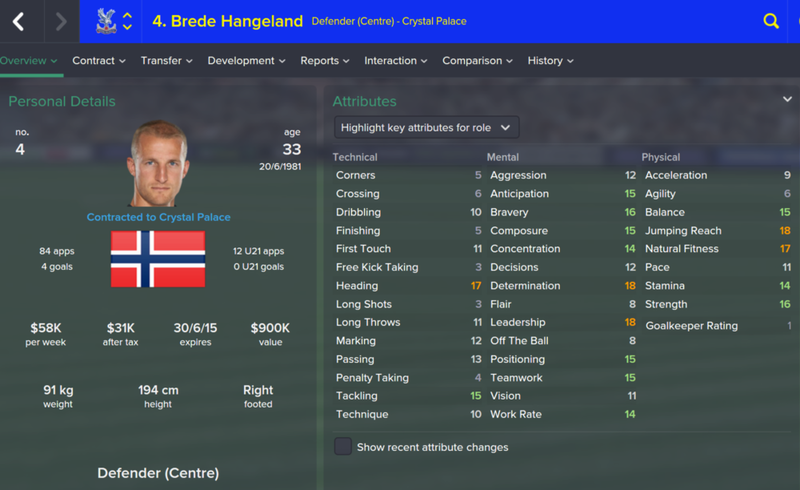 Brede Hangeland! Happy to meet again because he was one of Leeds leaders for me in Football Manager 2010 story. Brede made his way to Palace after Fulham got relegated to the Championship last season. He is already 33 years old, lacks speed and marking level. 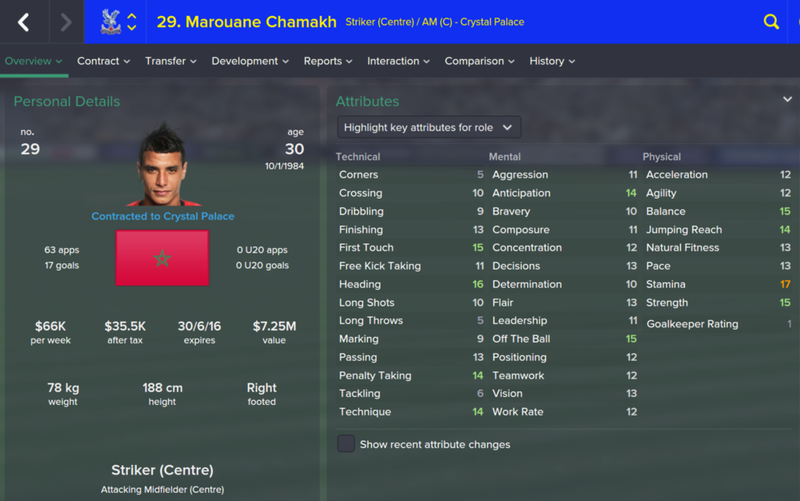 All other attributes hint about his huge importance for Crystal Palace in season 1. A true professional footballer! The second best central defender is surely Scott Dann who costs $12.5M. Resembles Brede Handgeland lacking determination and strength. Should be used in the starting line up of course. Dann's largest shortcoming is an injury-proneness. Both Brede and Scott like to pass ball directly what makes me thinking of trying Ball Playing Defender role at the back. Decent backups are Adrian Mariappa and Damien Delaney. May be some transfers will change whole picture but currently I am hesitating between playing 3 and 4 defenders at back. Got a feeling I need to buy a high prospect DL and/or DC who will already be able to play in the Premier League. Midfield is the most complicated area to make a decision. Firstly, let's take a look at its centre. Captain Mile Jedinak stands out here. The experienced ball winning midfielder with Concentration and Anticipation attributes equaling to 19 can play as DMC and MC in any non-playmaker role. Mile is a resolute consistent midfielder who enjoys big matches and likes to shoot the ball with power. 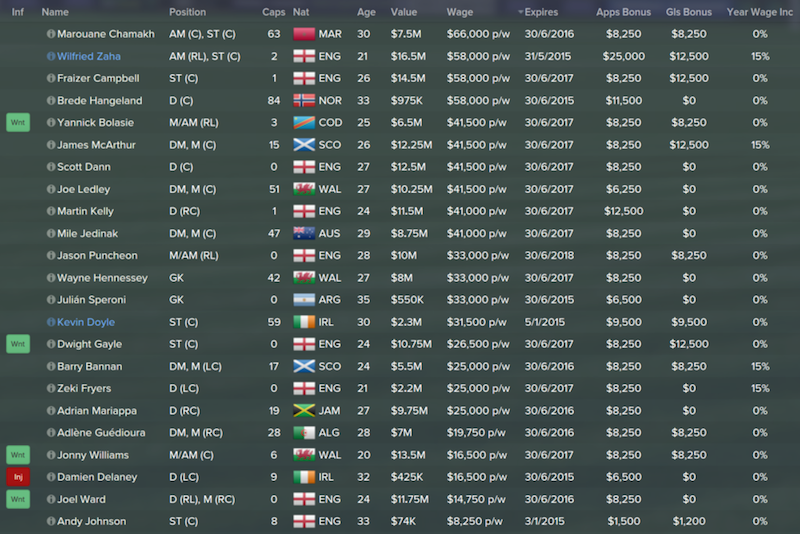 There's another person who can dictate tempo in the midfielder - James McArthur, $12.25M. Unlike Mile Jedinak, he can be characterized like playmaker with abilities to pull the strings in the midfield. McArthur's pros: high mental skills + good technique + excellent team work. High versatility. MC/AMC + competent level of ML/MR and AML/AMR. Work Rate is 14 what promises some further growth during trainings. I should pay a special attention to him onwards. Experienced Joe Ledley (MC/DMC) is the fourth midfielder who should be singled out. Superb hard team worker, likes to join attacks arriving to opposition area. It's interesting Ledley's skills are more than good enough to be used as central back. Maybe I should try to retrain him into DC somehow? Adlene Guedioura - he was performing for my Nottm Forest team in FM 2013. Decent ball- winning midfielder with high Work Rate (17) and Aggression (18). Barry Bannan. The Scotsman is quite versatile (ML, MC, DMC) and creative midfielder. He can add some brightness to attacking moves coming from a substitution bench. Stuart O'Keefe. Has potential to become a decent PL player. 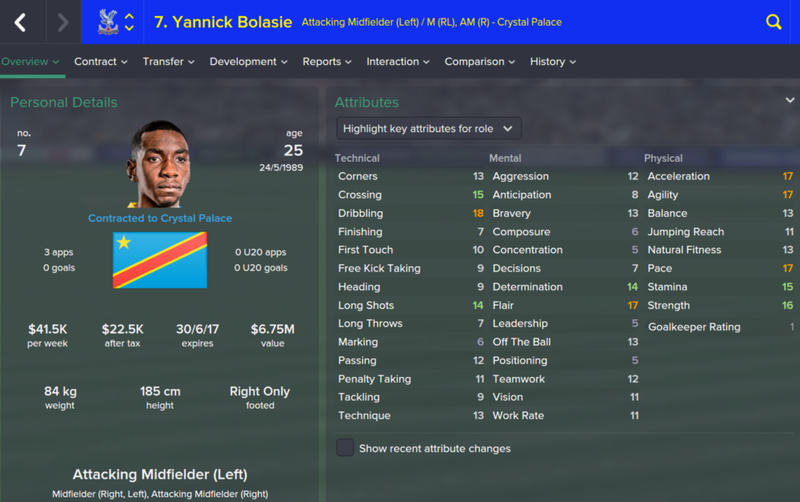 Here are two explosive wingers Yannick Bolasie and Wilfried Zaha. The latter is Crystal Palace club graduate who is now loaned from Manchester United. He is adored by Palace fans. I suppose great pace and explosiveness of both wingers should be used at full strength in new tactical schemes. I'd like to mention Jason Puncheon looking like a replacement for Zaha or Bolasie. He's very versatile and can play at any midfield position on both flanks. Jason's Finishing equals to 14 while Composure = 15. It means his suitable role is Inside Forward or this new Raumdeuter. By the way, I would be grateful if you share you experience with Raumdeuter role in the comments below. Already mentioned Barry Bannan can also play AML at competent level. AML and AMR positions must be present in new tactical formations. Vice versa MR and ML are not recommended to use. Though I shouldn't forget about possible transfers. Former Arsenal and Bordeaux striker Maroune Chamakh didn't say everything in his career. I believe he has certain chances to become Crystal Palace attacking leader. Yes, he's not that fast (Pace=13, Acceleration=12) and shoots ball not so well (Finishing=13, Composure=11). But in total Maroune can show high-level performance due to almost all attributes at good level, ability to play both feet and large experience behind his shoulders. I like quick and agile Dwight Gayle even more than Frazier Campbell. Dwight overcomes quite much Frazier in Finishing, Composure and Anticipation. These three attributes are important for any striker. Good old Andy Johnson is substitution bench player and current Palace U18 coach simultaneously. Kevin Doyle loaned from Wolves will leave our team. 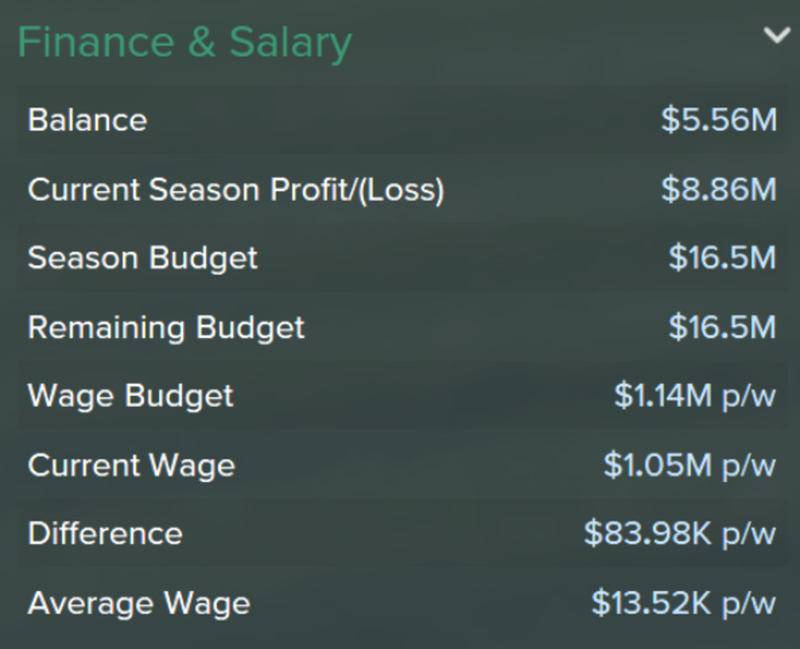 His level is not good enough for me bearing in $31.5K wage paid him on weekly basis. 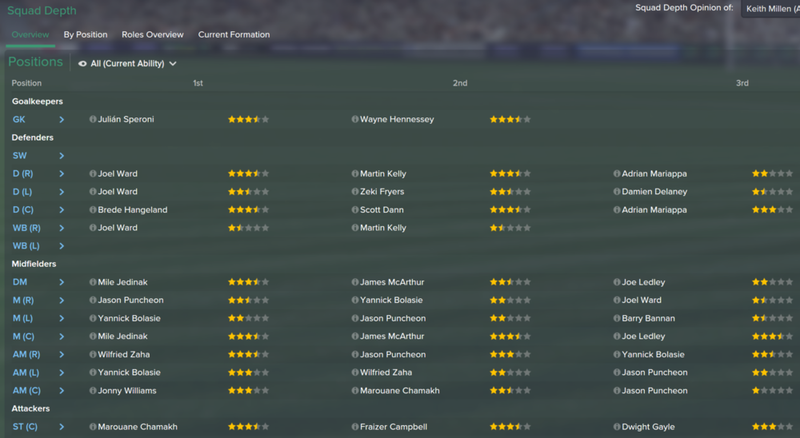 Probably this area will remain unchanged, no need for transfers because it seems I have enough quantity of strikers. 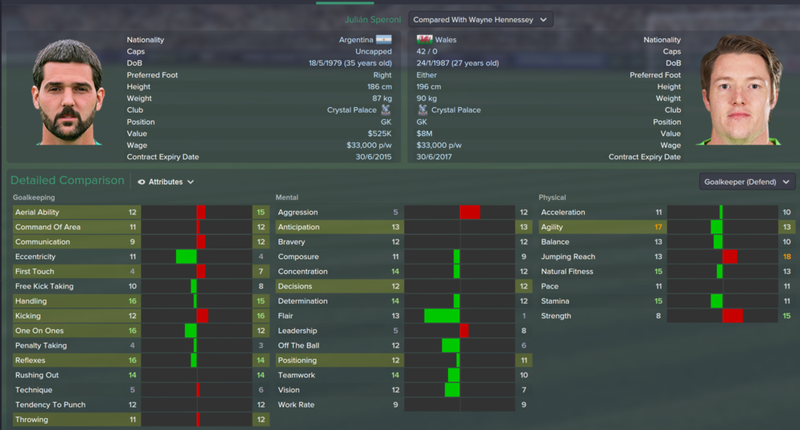 What tactical approach would you use for Crystal Palace if you were me?